LNG (liquefied natural gas) is unlikely to become the choice of fuel in Europe for road freight companies without any long term commitment from Governments, according to delegates and industry speakers at the NGV (natural gas vehicle) Europe Conference held in Amsterdam. Due to uncertainty over fuel duty in many European countries haulage companies and fleet operators are unwilling to bring in LNG (liquefied natural gas) in spite of the environmental and potential cost saving benefits. Federico Giovanetti, alternative fuels product manager at Iveco said “We need policymakers to set medium to long term tax measures”. A lack of consistency on fuel tax seems to be playing heavily on the minds of Belgian fleet operators whilst they wait for an announcement on LNG fuel duty. At that point decisions can be made as to whether LNG powered vehicles make sense commercially. In Belgium they do not tax LNG when it is used as a fuel for motor vehicles. Other countries that support LNG include UK, Italy, Sweden and the Netherlands. Gas duties in Sweden are around €0.58 per litre lower than diesel on average. Key industry representatives across Europe are worried that Governments will start to raise the duty before the sector has had a chance to really take off. The conference’s attendance figure of around 150 delegates, 450 less than 2013, has done very little to boost hopes of gas suppliers targeting the transport industry to plug the large gap in demand which has been left by Europes’s gas-to-power sector. The recent rise in gas prices across Europe hasn’t helped to entice transport managers away from diesel. Many key industry figures are confident that LNG will be cheaper in the long run, however switching from a tried and tested fuel such as diesel to LNG would require a leap of faith, which many haulage companies and freight operators are currently unwilling to take. The UK haulage industry seems to have an old school approach when it comes to adopting new technology, said a director of a UK based haulage firm. In the UK, companies can convert their diesel lorries to run on a dual fuel basis, this would require a much smaller investment than buying new lorries, however the cost is still very unappealing. Prices can vary depending on which vehicles you have but conversions can cost anywhere from £19k to £26k per vehicle. This amounts to a huge cost especially if you have a large fleet. In an industry where prices are fiercely competitive and margins are low the costs are just too high. Vehicle performance is also a large concern for fleet operators, even more so for lorries only powered by LNG rather than dual fueled. 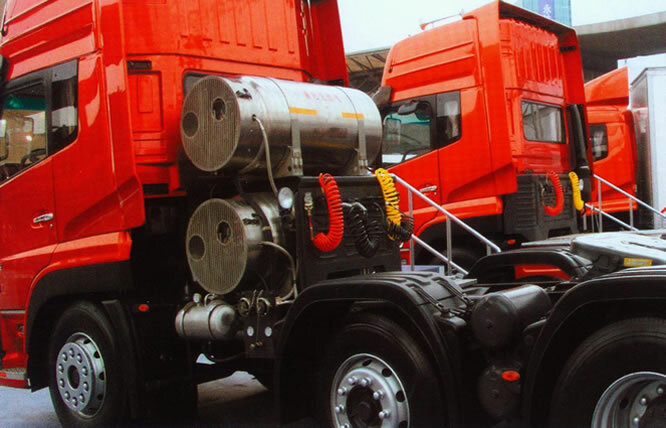 Most trucks would require at least 400hp and it is uncertain whether monofuel would give the power output needed. Not all UK companies have been off completely by LNG, supermarket giants Tesco and Sainsbury’s have dabbled with the LNG lorry market, although their NGV's only make up a miniscule proportion of their fleet. In spite of EU backed initiatives like the LNG Blue Corridors, which is a pilot project aimed to show LNG’s suitability as an alternative fuel to diesel for medium and long distance transport, uptake to LNG across Europe has been slow especially across road haulage. Europe’s lack of uptake with LNG is in complete contrast with Asia, China is now a global leader in LNG with over 2,000 filling stations across the country. In America due to low gas prices they are seeing many fleet operators switch over to LNG. Only time will tell whether Europe, the UK particularly, will begin to take to LNG. The issues seem to be more with an uncertainty of fuel duties and a current high gas price over anything else.